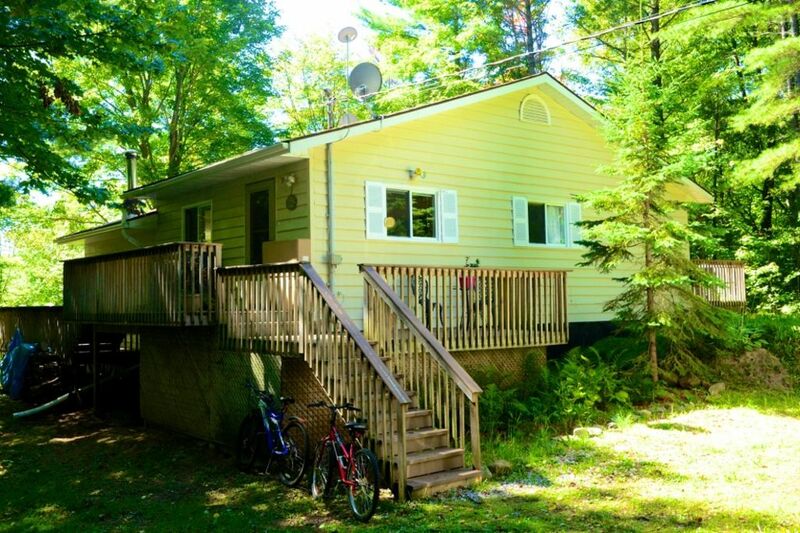 Beautiful Home 20 Minutes Outside Of Bracebridge, Canoe, Kayak, Or Just Relax! Enjoy the beautiful view of Muskoka River from the large deck while you enjoy your morning coffee. This view can be seen from the kitchen, living room and master bedroom. The second bedroom has a private deck. Walk down the hill to the river to sit by the water. A very relaxing atmosphere to enjoy your vacation. There is a barbecue and fire pit for your use. Everything you need, dishes, linens, etc. Plenty of space for your belongings. Just 20 minutes from Bracebridge. It was my dream to sell my family home of 32 years in Winona, Ontario and purchase a "cottagey" home in a "cottagey" environment. Plus purchase another home in Florida to visit in the winter. My dream was finally realized a few years ago. It is my wish that you can come and get as much enjoyment, relaxation and joy out of my home as I do. This is really paradise! I love this property as it has a cottage feel. Yet all the comforts of a house. The generator helps you feel safe in case of power outages. My home is extremely peaceful in the winter months. Snow is plowed by the town, driveway is well maintained. All wheel drive is recommended in winter in Bracebridge. I recommend to all wheel drive in the winter in Bracebridge. Roads & driveway to my home are plowed. Always drive for conditions. There may or may not be a renter in the separate basement unit. The town of Bracebridge is 20 minutes away. From the kitchen, hall, living room you have a beautiful view of the river below. You can sit on the large back deck or go down and sit on the dock. Relaxing is what this vacation will be all about! Walk down to the dock where you can have a swim or canoe or go for a kayak ride. Life jackets etc (2) etc. included. Or just read a book and relax on the Muskoka chairs on the dock! You can also fish. The dock and beach area, canoe & kayak may be shared if the basement unit is rented. Sunken living room with big picture window overlooks treed view looking down to Muskoka River. Coffee, sugar, creamer to get you started. There may be a travel trailer parked on property with guest(s), or guest in separate basement unit. We enjoyed our stay at the cottage. The dock was long which lead to very deep water. You couldn't just go from the shore though. It was very peaceful and quiet on the dock and area. Was there in August with my two boys. We had a great time. The cottage was very clean. Long walk to the dock so bring running shoes. The patio out back was lovely and shaded for afternoon reading! A great option for enjoying the Muskoka countryside while also enjoying some home comforts. We had a great time at Lori's cabin in the woods. Our son really enjoyed access to the river and use of the kayak. It's quite a steep climb down but we managed fine and are not very fit ! Sitting on the balcony felt like being in a tree house with views down to the river and we very much enjoyed sitting there for breakfast or with a beer in the evening. It's also only a 15 minute drive to the pretty down of Bracebridge and we drove as far as Parry Sound in only 90 minutes. The cabin is clean and comfortable rather than luxurious but it has all you need for a holiday let. At the time we stayed Lori was living in the basement but we did not really see her other than when we did a laundry. We would certainly consider this again when next in this part of Canada. I am glad you enjoyed your stay. It was a pleasure to meet your family! Hope to see you again when you are in the neighborhood!! Wonderful place to spend our week! Loved the home and the woods. Water is peaceful. Close to Lady Muskoka cruises, snow mobile trails, Santa's Village.